I haven't done a book review here in a while, so I thought I'd do one on this, one of the books I bought last month. Alex Marwood is the pseudonym of a press journalist currently living in London. 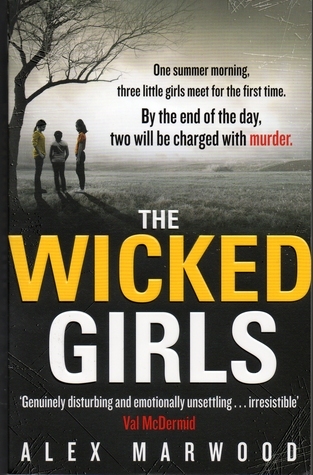 The Wicked Girls is a crime/thriller, was published in 2012, and if you haven't read it, you need to put it on your must-read list. Now. The noise was overwhelming, the feral, chanting voices of strangers wanting justice. THAT'S US. WE'RE THE GIRLS WHO KILLED CHLOE WE ARE THE DEVIL NOW. Twenty-five years ago two little girls were imprisoned for murder. Now journalist Kirsty Lindsay is reporting on a series of sickening attacks on young women and her investigation leads her to cleaner Amber Gordon. When I initially started reading this book, it took a while to get into it. I think I was trying to guess what was going to happen, which is a really bad habit of mine. Once you relax into it, it gets absorbing pretty quickly. Both female leads are strong characters, and they're so well-developed, I felt like I really knew them both by the end of the book. It's difficult to write a really comprehensive review without revealing a load of spoilers, but I'll try and give you some idea of what to expect from it. What lengths would you go to to protect the ones you love? What would you do if you were getting on with your life, and suddenly had to deal with the worst event in your past all over again? That's what happens to Amber and Kirsty. While we already know from the cover that the two girls committed a terrible offence all those years ago, we don't know the circumstances or the actual events surrounding that fateful day - until all is slowly revealed in short flashback chapters. It left me feeling slightly different about the whole lot - I didn't have sympathy for either, initially, but that had changed a little bit by the end. Would things have turned out differently if both girls had been given exactly the same opportunities to get their lives back on track after that horrific day? One of the women had to fight for everything she had, while the other seemed to have a little more encouragement. One was punished, while the other one was not only punished, but expected to know and do better. Both women ended up with very different outcomes at the end - begging the question, as I put forward in my synopsis of the book on Goodreads (there's a button over there on the right sidebar if you want to be my friend there), are we a product of our genes, or our environment? Who knows - but it is a very scary prospect to think of something in your past rearing its ugly head right out of the blue. I think that's what was the most frightening thing for me (not that I've a load of skeletons, but y'know) - the actions of an unrelated person brought the past mistakes of both these girls right back to haunt them. The tension bounces off the page, and I felt sick for the characters more than once. An absolutely brilliant piece of writing, and unlike another popular crime novel that everyone seems to be reading at the minute, this one has an ending worthy of the rest of the book. Not usually the kinda books I read, but you have me intrigued.. defo gonna put it on my list. Have just added this to my reading list! Sounds awesome, must read this! i kinda feel like i may have read this book but im not 100%, maybe i read a v similar one... ahhh i must start writing down the names of books ive read! !